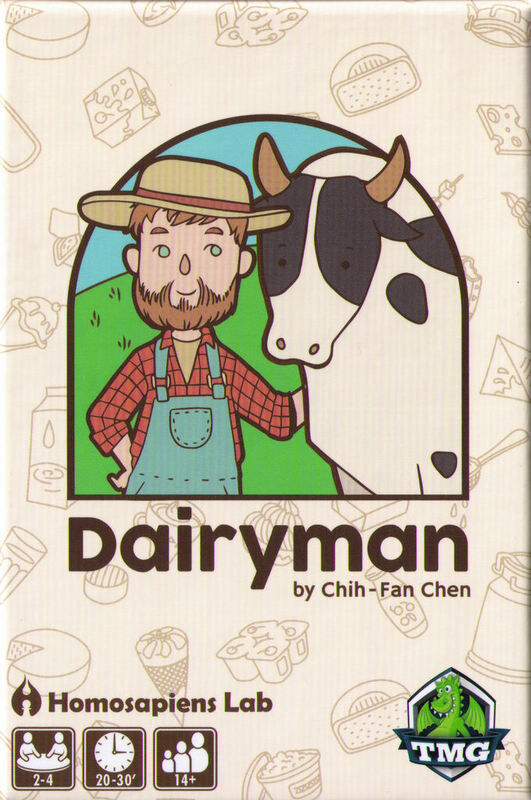 Dairyman is a game by Chih-Fan Chen, published by Tasty Minstrel Games. It is for 2-4 players. In this game, players take on the role of a dairyman as they try to fill the orders of the farm owner by producing fresh milk. They’ll also be able to transform that milk into cheese and ice cream to keep it from spoiling. In the end, the player that can produce the most milk and get the most points will be declared the winner. To begin, a number of backorder tokens and all the freeze tokens are placed in the middle of the play area. The number of backorder tokens used is dependant on the number of players. The remaining tokens are returned to the box. The 3 Barn tiles are placed in the center of the play area. All of the Milk tiles are shuffled together with the white milk side up. A stack is then made near the Barn tiles. The top 3 Milk tiles are placed in a line beneath the Barn tiles. The first player is chosen and they are given the 7 white dice and the 1 yellow die which are known as the Dairy dice. Play now begins. The game is played with each player taking turns. On a player’s turn, they will roll all the available dice. They must then Lock at least 1 set of 2 or 3 dice with a total of exactly 10, placing it on the #1 Barn tile. The player is allowed to Lock more than 1 set of dice at the same time, however the dice must all be placed on the same Barn tile. If the player has any remaining dice after that, they have the option of rerolling any unlocked dice or stopping. If they choose to reroll, then after rolling they must Lock in at least 1 set of dice in the same way as before. However if after rerolling the player is unable to lock a set of dice, they have failed to Produce Milk and their turn ends immediately. After the reroll, this time the player places the dice on the #2 Barn tile. If the player is able to Lock at least 1 set and they still have dice remaining, once more they can choose to reroll or stop. If they reroll a third time, they must Lock dice on the #3 Barn tile. The player will also gain a freeze token each time they choose to reroll. Even if they fail to Produce Milk, they will still gain the token. The player is able to use a freeze token before a reroll to prevent a die from being rolled. Whenever the player decides to stop rolling, they will then add the total of the dice on the Barn tiles and use them to claim Milk tiles. It should be noted that the player can also use an unlocked yellow die or freeze token to flip their Milk tiles to the other side. They can then use the special ability provided. Once a player finishes claiming tiles or they fail to Produce Milk, their turn ends. They will also be forced to take a backorder token. Backorder tokens allow the player to roll an extra red die on their turn but they must return it to the supply at the end of their turn and they also will lose 5 points at the end of the game if they still have it. The Dairy dice are then passed to the next player and the orders are refilled back up to 3 beneath the Barn tiles. The game continues with each player taking turns rolling dice and claiming tiles. Once the Milk tiles can not be refilled back up to 3 tiles, then the game ends immediately. Each player must add up the value of all their Milk tokens, deducting -5 points for each backorder token. Players compare their totals and the one with the most points is the winner. This is a small box game that doesn’t come with a lot of pieces. There are several dice included in the box. There are 7 white dice, a yellow die and 4 red dice. These are all pretty much your standard style of dice. Then there are the tiles and tokens. These are all thick cardboard. There are 3 barn tiles to place your dice on and 22 milk tiles that are double sided. There are 5 red backorder tokens that give negative points and 20 white freeze tokens that have little snowflakes on them. That’s it. The artwork on the barn and milk tiles is very minimalistic and there’s nothing elaborate about the designs. The barn tiles have different colored barns on them. The milk tiles have different dairy products on them such as a carton of milk or pitcher of milk on one side, while the flip side has cheese or ice cream cones on them. It’s a very simple looking game. That said it’s kind of nice that the designer felt there was no need to go overboard with the graphic design and make it look gaudy. Even though it’s very simplistic, I kind of like it. The iconography is pretty simple so there shouldn’t be any problems understanding what each one means. Overall I’m pretty good with the look and feel of the game. It’s not bad. The rulebook for this game is a large double sided sheet of thick paper. It’s full color and has several pictures on it including one that shows how the game should look when set up. It’s fairly simple to read through and understand. I didn’t see anything that should pose too much of a problem. Each aspect of the game is explained in fairly good detail. There’s even a section devoted to explaining each of the different icons on the tiles. Overall It’s not bad and shouldn’t take too long to read over. I feel like everything is explained well enough. It does a pretty good job of covering the rules. This is a fairly simple game to play. The quick and simple of it is that you roll dice and try to get 2 or 3 dice that add up to 10 to be able to place them on a barn tile. You can then press your luck to try and get more. That’s pretty much it. Well, there is a little bit more than that as you have options of not having to roll some dice and a few special abilities when you use either a die or freeze token to flip a milk token to the other side. Still there’s not a lot more to it than that. Is the theme painted on? Yes, it is. This could have been absolutely anything and the game would have still played pretty much the same. However I have to give credit to the designer as he chose a very unique theme that I’ve not seen in any other games before. Kudos for that. Speaking of the designer, you can most definitely feel his touch on the game. The whole flipping concept that is in this game harkens back to the same concept in Flip City. Not that this is a bad thing, it’s just very obvious. I realize that some of what I’m saying here may come across as kind of negative. It’s not though. The game itself is actually kind of fun. I like the simplicity of rolling the dice and trying to make combinations. It’s kind of like Yahtzee or King of Tokyo in that way. Another good thing about this game is that it takes up very little space. You can pretty much take it anywhere and play it. For me I like the game fairly well. It’s a game with a fairly unique theme that is fast and simple to play. Fans of dice rolling games like Yahtzee or King of Tokyo might enjoy this. I would also recommend this to anyone that enjoyed Flip City. Overall it’s a good game that I would recommend giving a try. 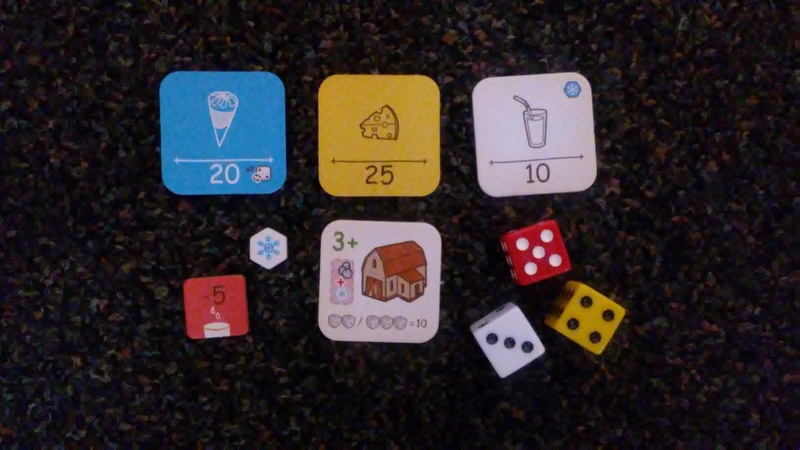 Dairyman is a small dice game with a unique theme. It’s fairly simple and plays rather quickly. Most game sessions last about 15-20 minutes. The artwork is very simplistic but interesting enough. I like the very minimalistic designs. This is a nice filler game that can be played by pretty much anyone. It’s very simple to play and is very easy to teach. The few icons are simple enough to remember and shouldn’t cause any problems. The theme is pretty much pasted on but is still unlike any that I’ve ever seen before. It’s a small box game so it’s pretty easy to carry. It doesn’t take up much room to play so it can be played pretty much anywhere. Fans of the designer’s other game Flip City should really enjoy the flipping aspect of this game. Fans of dice rolling games like Yahtzee or King of Tokyo might enjoy this one. Overall it’s a game of good fun that I rather like. It’s a good family filler game that I would recommend giving a try. Now if you’ll excuse me, there’s milking to be done. This entry was posted in Reviews and tagged board, board games, card, card games, chen, chih, chih fan, Chih-Fan Chen, dairy, dairyman, fan, games, man, minstrel, tasty, tasty minstrel games. Bookmark the permalink.